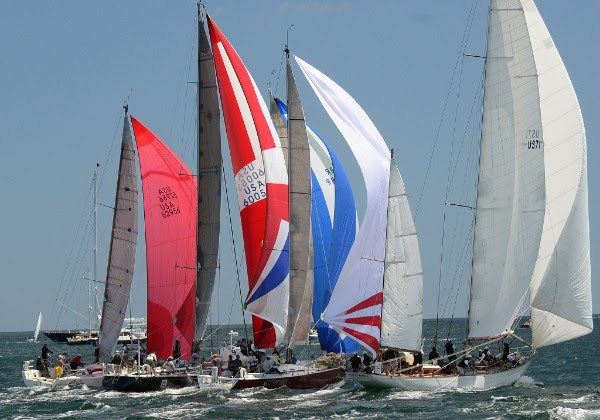 Making attempts at breaking records, surviving rough seas, reveling in starry nights and bonding over the adventure of navigating 635 miles of open water are all part of the longstanding and storied history of the Newport Bermuda Race, first held in 1906. Since its inception, over 52,000 sailors [more than twice the population of the city from which the racers depart] have checked this race off their bucket list as many consider this a “must do” in the world of yachting. When the first gun is heard on Friday, June 15, 2018, at 1:00 pm, a diverse fleet of 170 boats with sailors representing 24 nations and 35 out of the 50 United States will be underway to Bermuda. Gretchen Biemesderfer and her husband Daniel Biemesderfer are members of the Cruising Club of America, which, along with The Royal Bermuda Yacht Club, organizes the race. Residents of Guilford, Connecticut, the Biemesderfers are typical of the many sailors who are veterans of the race, sailing regularly with family and friends – a testament to both the bonding nature of competing as well as the social side of sailing and racing. For 2018, the Biemesderfers have entered Shearwater [USA 51428] in the St. David’s Lighthouse Division. There are three colleges represented in the fleet, the US Merchant Marine Academy [Kings Point, N.Y.], the US Naval Academy [Annapolis, Md.] and Webb Institute [Glen Cove, N.Y.], along with roughly 10 other youth teams from across New England and New York. Other teams travel from much farther afield. Sean McCarter, a native of Donegal, Ireland, currently living in Palma de Mallorca, Spain, is a crew on one of the more technologically advanced boats in the fleet, Maverick, which will easily stand out on the water with her Union Jack sails. “Excitement levels are high,” said McCarter of the mood onboard. McCarter has done his fair share of offshore sailing, including twice around the globe, but he was especially looking forward to his first Newport Bermuda Race with its great mix of history and tradition. “Maverick is a stripped-out race boat, with no comforts whatsoever. Basically, we built this boat two years ago and the brief was to design the fastest 46-foot yacht in the world and they achieved that very well. Aboard Warrior will be Annapolis native Ryan Breymaier, who currently resides in Antibes, France. Breymaier, who is doing the race for the fifth time, last sailed from Newport to Bermuda in 2015—a non-race year—breaking a course record on the maxi-trimaran Lending Club 2. Earlier this week, the Bermuda Race Roll of Honour announced Richard S. Nye and E. Llwyd Ecclestone as the latest sailors to be recognized for their contributions to the race’s history and stature. Nye was a 17-time competitor from the ‘50s through the ‘80s, winning twice. Ecclestone, of West Palm Beach, Florida, has sailed 22 races, winning once, and will have his 66-foot Kodiak on the line again tomorrow. Past honorees include Thomas Fleming Day, race founder in 1906; Clarence Kozlay and Robert Somerset, who together saved the lives of 10 sailors from a burning boat in the 1932 Bermuda Race; Sir Eldon Trimingham, who revived the race in the 1920s and represented the Royal Bermuda Yacht Club for many years; Carleton Mitchell, three-time race winner 1956-60; George Coumantaros, the skipper with the most elapsed time victories and sailor in 26 Bermuda Races; Olin J. Stephens II, designer of many Bermuda Race winners and a longtime race advisor; and Bermudian Warren A.H. Brown, who sailed in 20 Bermuda Races and voyaged to the corners of the seas. Are there any local boats/sailors involved? I believe Onion Juice has entered his spritely vessel “Pepper Spray” which will be navigated by Rev. Tweed and Captained by Chris Furbert financial backing from sources unknown. And when they’re disqualified for ignoring the rules they’ll scream racism and oligarchy .